Halloween is around the corner, the festival of all spooky things one can ever imagine; but still we all love it because it’s the festival of partying, jack-o-lanterns, trick-or-treating and the most importantly, costumes! Are you wondering which costume to wear this Halloween? Here’s a great idea – Bowser Bowsette Cosplay Costume! What’s so special about this costume? Well, first off, it’s the freshest idea and next, you are going to awe your party-mates easily with this lovely costume. You can customize this beautiful costume from New Super Mario Bros and make it accurately fitting to you, with every detail and exactly made according to the original version, to let you have great fun! 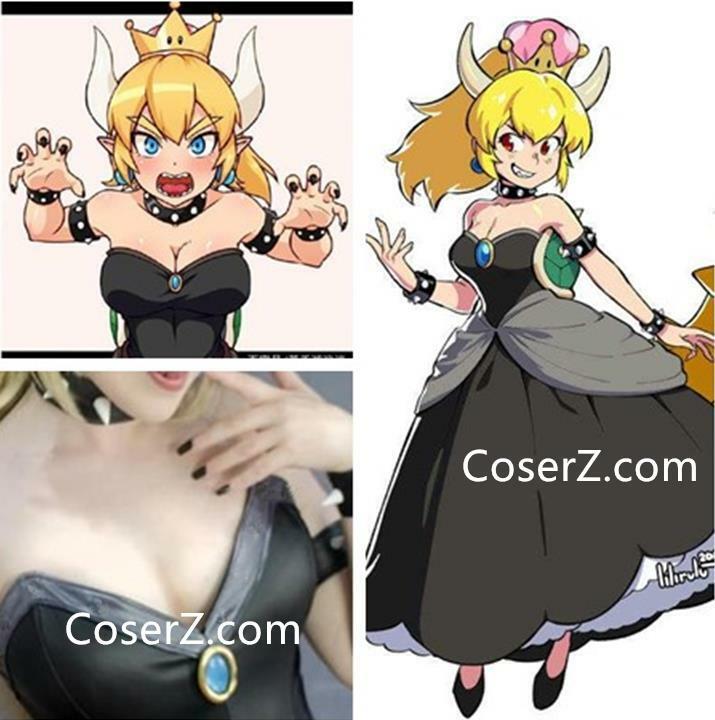 Here’s the interesting story of Bowsette which will make you long for this costume! Bowsette, also called Koppa Hime in Japanese, is an anthropomorphized genderbend version of Bowser, the Super Mario villain. It’s occurred due to the effects of the power of Super Crown. As soon as the character was created after the launch of a trailer for New Super Mario Bros. U Deluxe, the character of Bowsette spread like wildfire on the Eastern as well as Western Web! The trailer unveiled on 13th September 2018 for the Nintendo Switch introduced a unique power for Toadette, the Super Crown, which enables her to get converted into a character named Peachette (originated from the series’ Princess Peach). On 19th September 2018, a Twitter user Haniwa aka @ayyk92 posted a comic wherein, after Bowser and Mario are rejected romantically by Peach (based on Super Mario Odyssey episodes), Bowser transforms as Toadette into “Peachette”, a human woman. Next, Mario and the female Bowser appear to be dating. The comic earned more than 15,000 retweets and 42,000 likes just within a few days. They also posted the comic to their DeviantART just a few minutes before the Twitter post; but this version could collect only about 4,600 favorites in the next ten days. The comic underwent numerous edits with subtle changes like red hair, darker skin tone etc. But the character of Bowsette inspired her own fan art too. Various initial fan art even maintained the theme from the earlier comic edits. During the week after the launch of the original comic, numerous artists made fan art of the character, making Bowsette a leading topic of discussion in several anime communities. So, what do you think now? Don’t you think that your Bowsette costume will be a super hit this Halloween?